Schreiber High School senior Chris Pantelias eagerly awaits the review of his Eagle Scout service project, which he started in late 2018. On a blistering cold morning this past December, Pantelias stood over a worktable in his garage. It was piled high with the wood, nails and tools Pantelias needed to build a food donation box that would ultimately be placed in front of Stop & Shop. “I wanted to give back and help the less fortunate so they have more food in the winter months,” said Pantelias. Hearing that kind of sentiment coming from Pantelias isn’t surprising. He’s a Boy Scout leader in Troop 7 in Port Washington. Giving back to the community is one of the driving forces of the Boy Scouts. 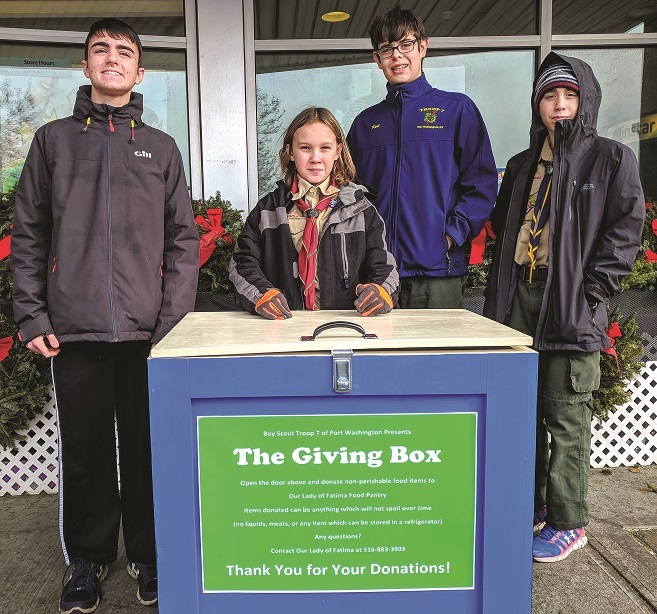 In fact, creating the food donation box is part of Pantelias’ Eagle Scout Service Project. “Becoming an Eagle Scout is the top award a young person can receive in Scouting,” said Andy Johns, the Scoutmaster of Troop 7. Pantelias has been building up to this moment ever since he joined the Scouts in ninth grade. Over the years, he achieved rank advancement by earning merit badges in various categories such as Emergency Preparedness, First Aid and Citizenship in the Community. To be an Eagle Scout you must earn at least 21 merit badges. He also took on various leadership roles that demonstrated his adherence to the Scouting ideals including trustworthiness, loyalty, bravery and more. A key element in the Eagle Scout process is the planning and execution of a significant service project that benefits the community. For his project, Pantelias came up with the Food Donation box. Stop & Shop approved the plan and Pantelias was all set to start building his project when he hit a snag. Boy Scouts are nothing if not prepared. Using the leadership skills he honed throughout his Boy Scout life, Pantelias presented his project a second time. Once again it was approved. 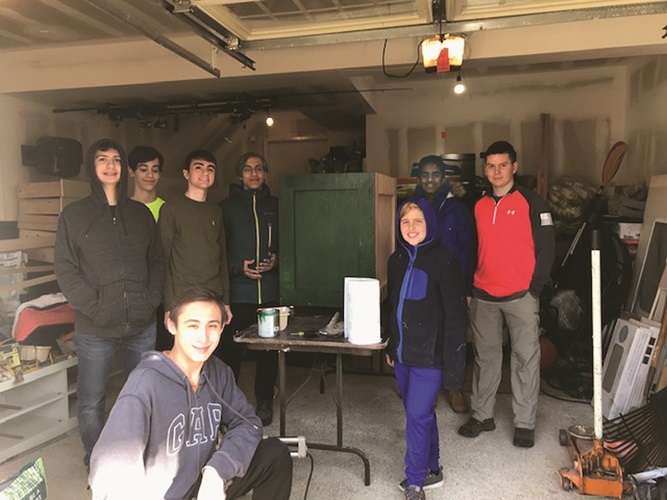 So, Pantelias, along with several other members of Troop 7 gathered in the garage to build the Food Donation Box. The following day, they set it up in front of Stop & Shop and spent a few hours standing out front telling shoppers about the project and how they could donate. With his service project completed, the final step of the process is the board of review. Once he achieves this goal, Pantelias will join the ranks of other Eagle Scouts including President Gerald Ford, Astronaut Neil Armstrong and former NYC Mayor Michael Bloomberg. Troop 7 meets on Wednesday nights at the United Methodist Church of Port Washington throughout the school year. For more information, visit www.troop7bsa.com. Maria Lane is a writer, TV Producer and active parent in BSA Troop 7.